French colonial elegance greets guests in each step of their experience at Sofitel Phnom Penh Phokeethra. Delight in one of our four gourmet restaurants for the ultimate culinary journey. Life is Magnifique in Phnom Penh. Each Sofitel is a unique blend of the French art de vivre and local refinement. 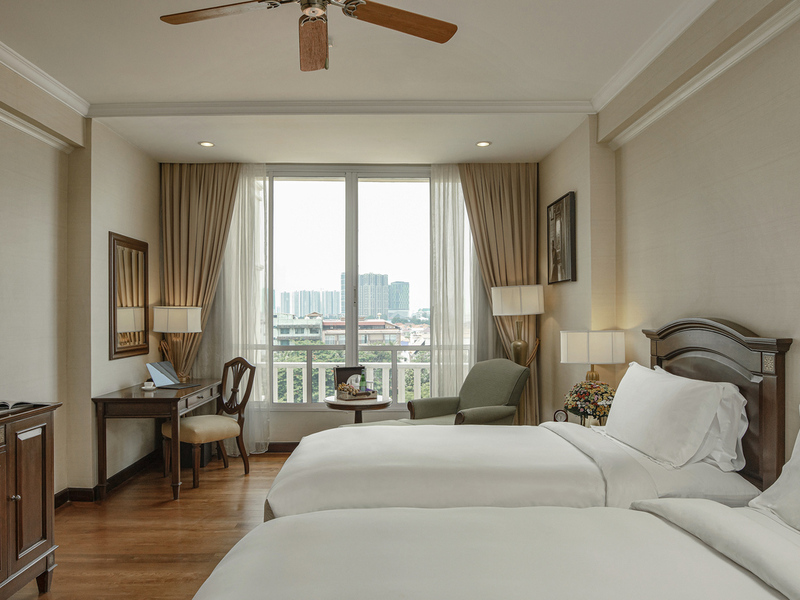 Situated on the Riverside, Sofitel Phnom Penh Phokeethra fuses French colonial design with traditional Cambodian feeling. The hotel's 201 rooms and suites are designed in an evocative colonial style featuring modern Khmer tones, with polished hardwood floors, natural light and thoughtful amenities. providing you with the perfect base from which to roam around the city. Luxury in the upcoming city. 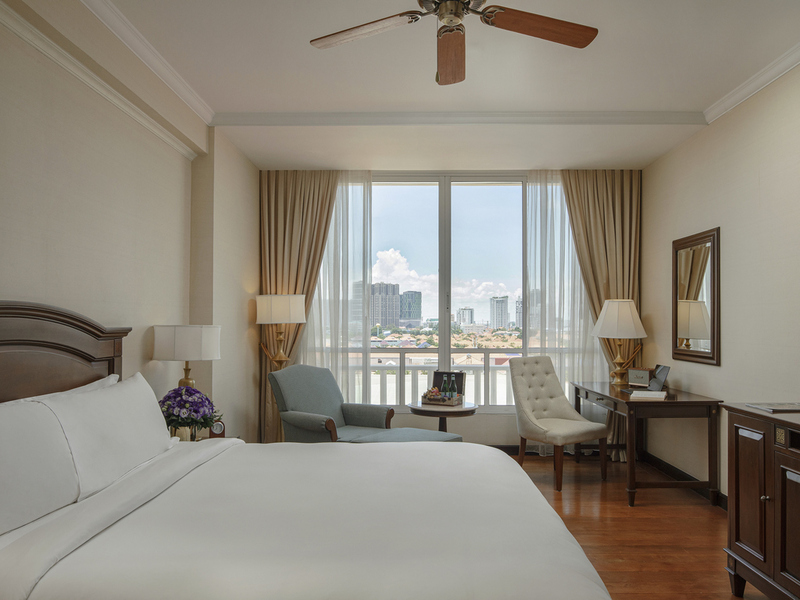 Set on the charming Riverfront, Sofitel Phnom Penh Phokeethra is in close vicinity to a large-scale luxury shopping mall, government offices, embassies and major tourist attractions. 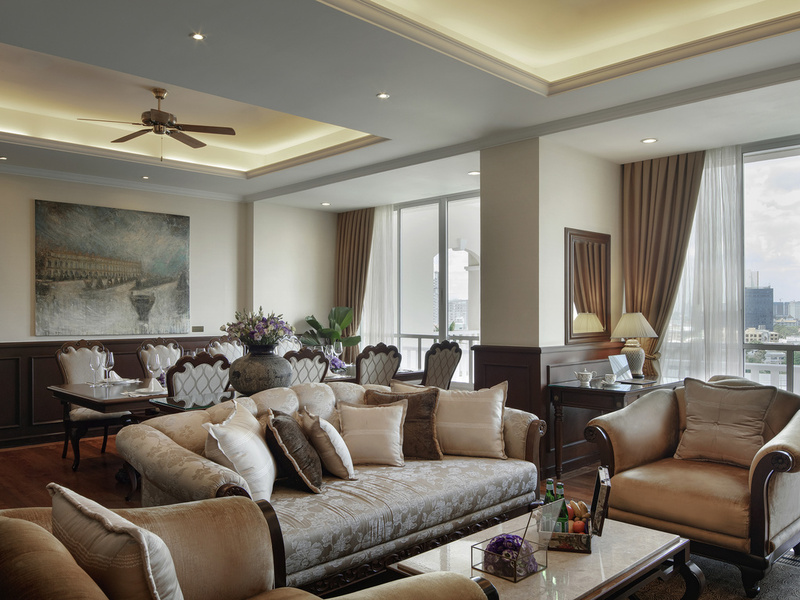 Retreat to a palatial suite overlooking the river or Phnom Penh city views. Discover sophisticated spaces decked out in hardwood floors, warm colour tones, contemporary technology - including complimentary WiFi - and luxurious French amenities. Guests staying in club rooms and suites savour not only the hotels premier luxury accommodation but also enjoy a wealth of exclusive privileges including access to the sophisticated retreat of the Club Millésime executive lounge. Club Millesime celebrates the art de vivre with a focus on fine wines refined service and haute design. VIP benefits include express check-in complimentary late check-out all-day refreshments daily club breakfasts and evening Millésime wine tastings. Offering a wide range of delicious and carefully prepared meals served at your convenience in the comfort of your room. Open 24 hours a day. Sip sparkling champagne or a perfectly brewed cappuccino in the elegant surrounds of Sofitel Phnom Penh Phokeethra's lobby lounge Le Bar. Refresh poolside with a chilled cocktail or luscious tropical juice at Aqua. Sofitels 2 storey event space features state of the art video conferencing advanced LCD projectors a translation booth versatile stage oversized elevator for exhibition pieces a 1200 sqm pre-function area with natural daylight and expert support. Sofitel's InspiredWeddings Planner is your guide in customising a wedding event to reflect your personal love story. The Planner looks after each detail of your wedding with passion, talent, expertise and dedication. Rich Chinese wedding delicacies or French gourmet creations grace a wedding banquet tailored to your desires. Pristine white wedding cake serves as a sweet homage to your love, while fine champagnes lead fitting toasts to your sparkling future. Floral arches lead the way to an opulent ballroom. Sofitel Phnom Penh Phokeethra accommodates even the most extravagant weddings, with the grand ballroom hosting banquets for up to 1,100 guests - in addition to several more intimate venues. 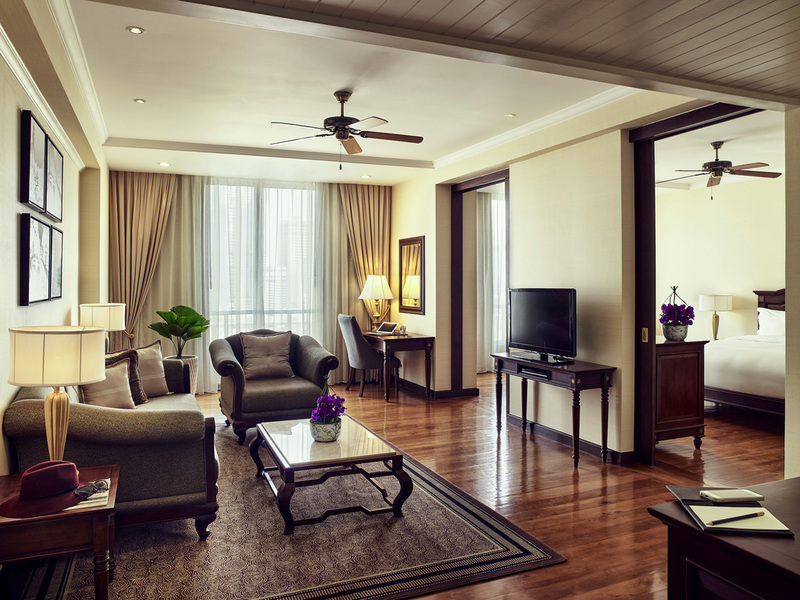 Sofitel Phokeethra Phnom Penh features 201 rooms and suites, each showcasing French colonial style and lavishing your wedding guests with modern comforts and 5-star indulgences. 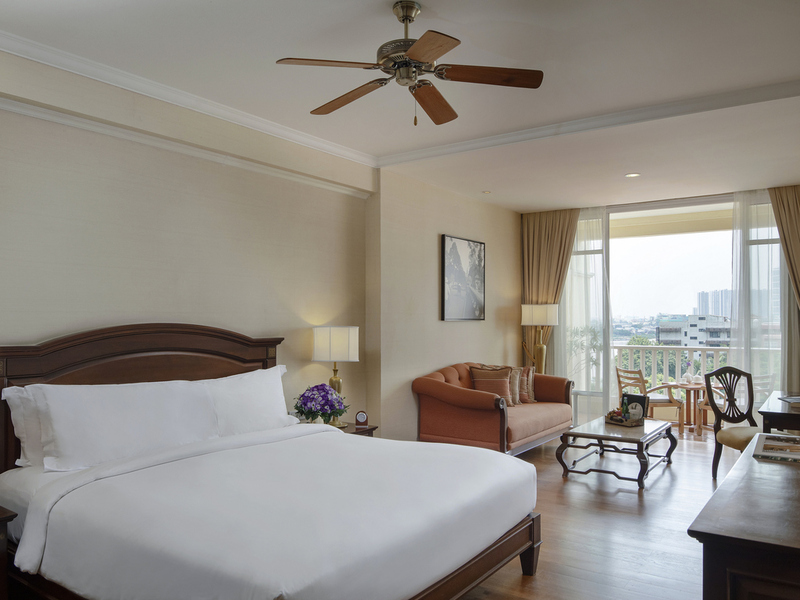 Sofitel Phnom Penh Phokeethra is located in the old French Quarter on Sothearos Boulevard. Weddings guests arriving by air will find the hotel just a 15-minute drive from Phnom Penh International Airport. Worldwide ancient traditions meet the refinement and skill of the latest in French cosmetology to create SoSPA: an exhilarating and rejuvenating experience. 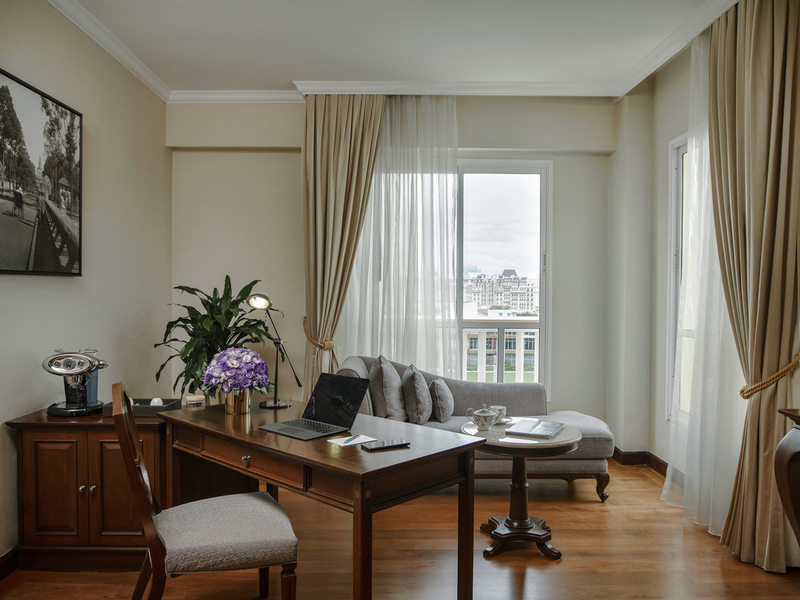 Guests staying at Sofitel Phnom Penh Phokeethra enjoy a full range of 5-star leisure and business hotel services on site enabling them to make the most of their stay. Guests also get access the to the Phokeethra Sports Club's extensive facilities. Experience a city life with tradition and a burgeoning nightlife. Whether driving a hard bargain at an outdoor market or sampling the unique flavours of French-influenced local cuisine, Phnom Penh has all the charm of a city largely untouched by tourism. Travel Phnom Penh in style and take in the sights and sounds of the city at your own leisurely pace from the seemless comfort of our luxury vehicles. Arrive from the airport or explore the city with one of our exclusive limousines and private driver. Enjoy a morning or afternoon on the greens at the 18-hole course of Grand Phnom Penh Golf Club by Nicklaus Design - or the unique Phokeethra Country Club in Siem Reap. The hotel's concierge will be happy to assist with bookings and transport. Work out within the hotel at So Fit and take a dip in the Sofitel swimming pool or take advantage of complimentary access to the extensive facilities of Phokeetra Sports Club. Enjoy a state-of-the-art gym tennis courts squash and the club pool.